I am so ready for this holiday weekend (it's Labor Day in the US). My husband took off tomorrow, so we will have a 4-day weekend. I may need to plan a girls' day out one day, LOL! I made a quick little card tonight. It came together rather easily! 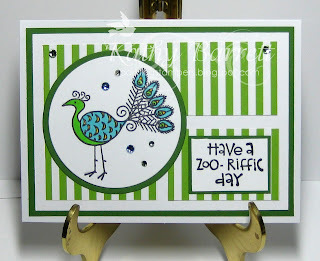 I used an old Cornish Heritage Farm stamp set from the Kim Hughes Collection. The cute little peacock colors up really quickly! I pulled out some Doodlebug dp and found this stripe that coordinated beautifully. I had originally started out with a different sketch, but switched to this one from The House That Stamps Built. The cs is Bazzill and I used 3 different colors of Swarovskis for bling. I think Margaret is back tomorrow, but if not, I will be here! Love your card! Thanks for joining us at The Crazy Challenges. Thank you for joining us at Nutcrafters for our spots/stripes challenge. Such a cute peacock. Thanks for playing along with us at Cards in Envy. Neat little card with such a fun image. Thank you for entering this week's animal challenge at Inky Impressions. Beautiful card! The colors are just perfect for your lovely peacock. I love the added gems and fun sentiment. Thanks for playing with us over at Cards in Envy! LOVE LOVE the colors here!!!! great card!!! thanks sooo much for playing along with Cards in Envy!!!! Adorable! Fabulous card and I love your wonderful bird! Thanks for sharing with us at Cards in Envy! Congratulations! Your card has been chosen as the FIRST CLASS card for the Cards in Envy challenge! The designers loved your card! Please email me at: cardsenvydt@gmail.com with First Class Birds as your subject and I will email you the First Class badge for you blog! Thanks again, for playing with out challenge at Cards in Envy! Love your peacock card!! Congrats on winning at Cards in Envy! Oops! The correct email is cardenvy@gmail.com to claim your badge for First Class at Cards in Envy.